Hi Jorn! I like you idea, and agree with you to some extent. Could you elaborate a bit on your picture and ideas beneath? I am interested to understand why you put “industry best practice” entirely into the death zone. I placed the “industry best practices” label into the death zone to focus attention on the meaning of “industry best practices”. By definition useful practices that are accepted within an industry are in the public domain, and therefore are not suitable for providing an organisation with a collaborative edge. If you look closely, you will notice that each of the labels is associated with exactly one of the depicted sets. 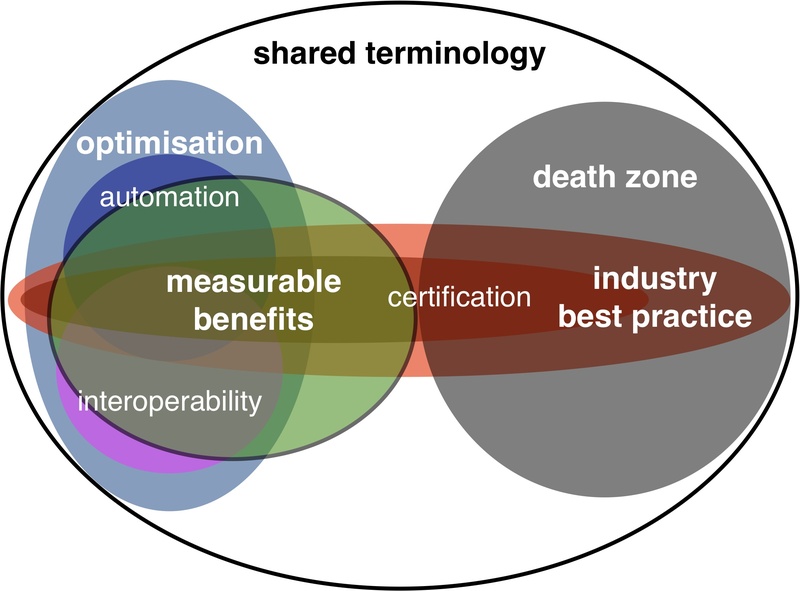 The “death zone” label obviously belongs to the grey set, which means that the “industry best practices” label must belong to the orange set that intersects the “death zone” as well as the “measurable benefits” set. With this in mind, decoding the rest of the picture is fairly straight forward. I have got a longer post in mind to elaborate the implications. Did not want to give away the entire story in a single post. In this comment I have possibly introduced yet another puzzle by talking about the “collaborative edge”, rather than the competitive edge. In a nutshell I have come to the conclusion that the concept of a competitive edge is rapidly becoming outdated. Today we are creating deep Web service supply chains, and if we want to create truly adaptive and resilient systems, the aspect of collaboration is far more important than the aspect of competition. Again, the bigger picture on this topic requires a longer post. There is a very nice talk by Rachel Botsman that provides food for thought along these lines at http://s23m.org/S23M/index.html. OK, thanks. I should have seen that the “Industry best practices” zone extends up to the “light” side. Speaking of a dark side for standardisation, “best practices” and “certification” may for sure lead to false understanding (like with any language), and also making easier to tend to take the easy way out with an uncertain mapping to real concerns. Not speaking of killing the, so needed when facing to complexity, creativity. “Optimisation” stays a bit vague for me. By the way, I agree that “collaborative” has much value today than “competitive”. I use to talk about “coopetitors” rather than “competitors” when speaking about commercial partners.